So, you’ve survived the Lower Spire (or if you haven’t yet, see my post on how to do it), now it’s time to face Professor Putricide and his adorable little monstrosities. Here are some tips on how to live through the encounters. Hunters: Put up Aspect of the Wild on Stinky if you don’t have a shaman to drop nature resist totem. It’ll really help with the AOE pulse damage. Druids: Barkskin before decimates. Start rolling rejuvs on the raid before a decimate hits. In the 25-man, you need 7 people at range to avoid Vile Gas being cast on the melee. If you want to play it safe, keep 8 people outside. If you have enough ranged dps, the healers can stand with the melee so they don’t have to worry about moving or Vile Gas. But if you do need a healer or two to stand out, druids are your best bet. Ranged must be 10-12 yards apart to avoid spreading Vile Gas. There should be three spore groups. One in each of the ranged groups and one in the melee. You need to be within 8 yards of a spore to get the inoculate debuff. Make sure to wait for the spore to explode before spreading out again. For the melee, whoever gets the spore should position themselves in the middle of the hitbox so the tanks are in range to get the debuff. Hunters: Make use of Disengage to quickly spread out after a spore. After three spores, Festergut exhales, doing massive damage to the whole raid, which is reduced by the Inoculate debuffs. If anyone does not have 3 stacks of the debuff, damage reducing abilities will need to be used to prevent them from dying. Mages can increase their dps time by ignoring the first 3 spores and Iceblocking through the first Blight. Druids: This is a good time to pop barkskin. The intensity of the healing on this fight shifts as Festergut inhales. At the beginning of the fight, when the room is covered in orange gas, the raid damage is very heavy (especially watch the first people who get the Vile Gas debuff), and the damage on the tanks is fairly light. With every inhale and inoculate debuff that goes up, the raid damage gets lower and the tank damage gets higher. Slime spray can very easily kill those who aren’t paying attention. Everyone except the Ooze kiter and the hunters should stand in a tight circle around Rotface. When the boss sprays slime in your direction, just strafe to the side or run through the boss to avoid it. The spray occurs in a cone in front of the boss. It will travel the length of the room, you cannot outrange it. Hunters: Since we can’t stand right on the boss, we have the furthest distance to move to avoid slime spray. Disengage can be used to move quickly to the side. Unfortunately, Deterrence does not work on the spray. Druids: If you happen to get caught in a Slime Spray, use Barkskin. A Wild Growth on the melee should take care of most people who take a tick of slime damage. When you get a mutated infection, run to the area between the Ooze kiter and the big ooze. Wait until you’re cleansed and are sure the small ooze is going to merge before running back to the boss. Pay extra attention to the slime spray as you run out. Getting hit with it in addition to the damage from the mutated infection will likely kill you. Druids: Pop Barksin if you get a mutated infection. When 6 small oozes have merged, the large ooze will explode. When running out of the center of the room, move with the tank. Rotface will usually do a slime spray at some point during an explosion and staying close to him makes it easier to avoid. – There is quite a bit of movement on this fight. Try to stutter-step as much as you can so your autoshots continue to fire while you’re moving. – Use Disengage to quickly get where you need to go. – Don’t feign while you have a small ooze on you. It’ll aggro on someone else. Volatile Ooze will always be used first in the fight. It will root it’s target in place and blow up if it reaches them. Hunters: As the ooze is spawning, you’ll want to stand at your max attack distance from it and start damaging it as soon as you can. If you are targeted by the ooze, you can use Feign Death when it’s just about to reach you. It will usually take it about 10 seconds to get a new target which will give extra time to kill it before it can explode. Druids: Keep full HoTs on the person who gets targeted by the ooze. If you are targeted, pop Barkskin. 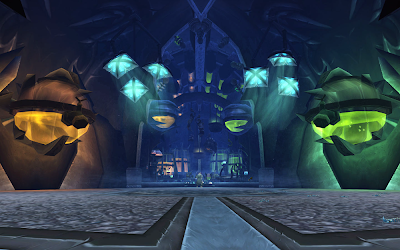 Other classes: Many classes have a way to prolong the time the raid has to kill the ooze before it reaches you. Mages can Blink away and Iceblock when the ooze is close. Rogues can Vanish. Hunters can feign. Warlocks can use their portal to get further away. Gas clouds need to be kited around the room. They do a significant amount of damage to their target and will do damage to the whole raid if they catch them. Druids: Keep full HoTs on the person who gets targetted by the ooze. If you are targeed, pop Barkskin. If the cloud is getting too close for comfort, you can go into kitty form and dash. Once phase 2 starts, Putricide gains two more abilities. Don’t stand near the orange flasks on the floor. Watch your range once phase 2 starts. One of the worst things you can do is stand just outside of melee range. If you get targeted by a malleable ooze it can easily kill a lot of people. Stand far away from Putricide so you can see when an ooze is bouncing towards you and have time to get out of the way. Once phase 3 starts, adds stop spawning, but raid and tank damage increases. Watch out for the slime puddles that will start spreading throughout the room. Hunters: Put out as much damage as you possibly can. Continue to watch out for Gas Bombs and Malleable Ooze. Druids: Pop Barkskin on cooldown in this phase. Keep the raid blanketed in Rejuvs and pre-HoT the tanks when a switch is coming. Druids: As many people have pointed out, the Revitalize talent will give energy to the abomination. I like to keep a rejuv rolling on it at all times. That’s it for the Plagueworks. I’ll do a post on the Crimson Halls later in the week. This entry was posted in WoW and tagged damage mitigation, Druid, Hunter, icc, Raiding, Strategy. Bookmark the permalink.